Jennette Fulda went to bed on February 17, 2008, with a headache, and more than three years later, it still hasn’t gone away. Yes, she’s tried everything: intravenous drugs, chiropractic adjustments, acupuncture, subliminal messaging, marijuana (for medical purposes only), heavy drinking (which just made it hurt more), and lots and lots of chocolate. A pint of ice cream makes her feel better, but her insurance doesn’t cover mint chocolate chip. In this painfully honest, smart, and funny memoir, the popular PastaQueen.com blogger who chronicled her nearly two hundred pound weight loss in Half-Assed shares her incredible journey to find relief from a chronic headache. As she visits countless doctors, indulges all manner of unsolicited advice from the Internet, and investigates every possible cause, from a brain tumor to a dead twin living in her brain, Jennette considers what it means to suffer, how to live with pain, and why the best treatment might be the simplest: laughter. 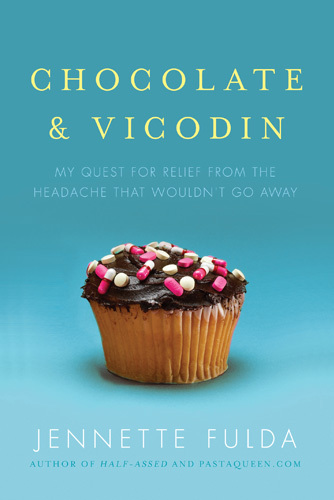 If you’ve got a headache that won’t go away, or if reading about mine gave you a headache, here are some resources that might help better than chocolate and Vicodin would. The world’s largest voluntary organization for the support of headache sufferers. They maintain a list of headache specialists around the country and provide headache information and support. An online community for younger women with chronic health issues created by Jenni Prokopy. Be sure to browse the forums and sign up for the newsletter. A blog by Kerrie Smyres that provides a candid look at managing and living with headaches and migraines. Insightful blog written by another women with a headache that won’t go away. A blog by Diana Lee that blends news, information and experiences about life with migraine disease, depression, chronic pain and other chronic and invisible illnesses. Information on antidepressants, anticonvulsants, antipsychotics and other mind-altering drugs written in a funny, conversational tone by people who’ve taken them. Service that will email you a health forecast the day before your health problem may be aggravated by changes in the weather. A registry of federally and privately supported clinical trials conducted in the United States and around the world. A listing of the different types of headaches recognized by the International Headache Society. Forums for people with New Daily Persistent Headache. WebMD’s resources for headaches and migraines. A listing of information and articles about headaches. An in-depth, darkly funny account of the author’s battle with an unrelenting headache. Provides in-depth information about headache treatments and society’s attitudes towards chronic pain while also recounting the author’s personal story. Reveals 44 tips on how to cope with chronic illness drawn from the author’s experience with a genetic respiratory disease. Reading it is like getting advice from a smarter, more experienced, big sister. A collection of interviews with dozens of chronic pain experts and sufferers. Provides a broad cross-section of the different ideas and attitudes people have about chronic pain. A look at the biological mechanisms that determine how and why we experience pain written by an expert neuroscientist. Informative, but somewhat technical. A thoroughly researched look at pain through the filters of metaphor, religion, science, history, and the author’s personal experiences. A must-read for anyone who suffers from chronic pain or knows someone who does. Here’s the article I refer to in Chapter 6 about headache caused by teratoma of the ovary: “Diagnosis: Brain Drain,” Sanders, Lisa. The New York Times. 7 Nov. 2008.